Comic-Con Has Inspired A Musical And It's Playing At Stan Lee's Comickaze! 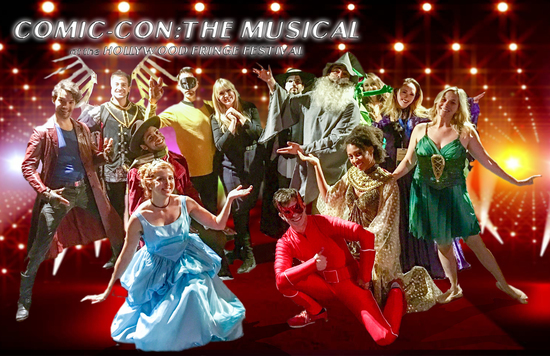 UPDATE: Select scenes from Comic-Con the Musical will perform Sunday, October 29 at 12:15 p.m., at Stan Lee’s Comickaze (LA Comic Con). They’ll be featured in a section called Nerdfest 2017. It’s not the first time that Comic-Con has caused people to burst into song. A couple of years ago the Nerdist posted their version of Comic-Con the Musical. But this is the first time that the title applies to a full-length stage musical, at one of the best alternative theaters in Los Angeles: the Sacred Fools Theater Company. With two performances left in the Hollywood Fringe Festival (June 18 and June 22), we can only hope that this spawns another production, and another. Because let’s face it — as Comic-Con fans, we had it coming, and this deserves immortality. Every year, a seemingly harmless convention center in beautiful downtown San Diego is overrun by a scene unlike any you’ve ever seen… Comic-Con – a place where fans, wannabes, and pop culture icons mix, mingle, and party. This year promises to be the greatest Con of all time as fallen-from-grace film icon Allen Gray pulls a ‘Willy Wonka’ and offers to make one special attendee’s dream come true in the form of a movie deal. Anna journeys to Comic-Con in the hopes of getting her fanfic validated by her idol, DB Coates – creator of her favorite comic book series Vempire and the basis for all of her writing. Jason wants people to read and geek-out over a comic book of his own creation, Super Christian Psychic Alcoholic Alien Detective. (Inspired by his mom. )(Don’t ask.) Drew attempts to find the collectable missing from his shelf and his life, a character that may only exist in his mind and on his sketch pad. Photo by Monique A. LeBleu ~ Michael D’ Elia, Luke Adams, Christina Lea, Shawn Skye and company in Comic-Con the Musical. The best night of fun you’ll have this side of a San Diego Con hotel room after party of any size. At the Sacred Fools Theater, Hollywood Fringe Festival, June 2, 2017. What can you expect from Comic-Con the Musical? A little bit of BAM and a whole lot of POW! 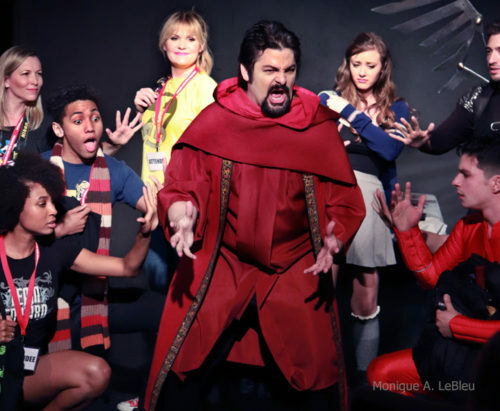 Photo by Monique A. LeBleu ~ Luke Adams, as the Dungeon Master, and company in Comic-Con the Musical. The best night of fun you’ll have this side of a San Diego Con hotel room after party of any size. At the Sacred Fools Theater, Hollywood Fringe Festival, June 2, 2017. To be honest, it all seems realistic so far. Even with the music.